If you’re finding it challenging to create change in your life, one way might just give you the incentive you need to get up, take action and do things differently – living each day like it was your last. Why can it be helpful to do this? Well, so many of your problems can be caused by worrying about issues you experienced in the past, having experiences you don’t like in the present and through worrying and be concerned about the future. However, if you lived your life everyday like it was your last; do you think you would experience even half the problems you currently do? Do you live your life in fear of not doing what it is that you want to? Are you worried about making a fool out of yourself, or being overly concerned about what others think of you? Well, imagine if today was your last day on Earth. Do you think you would pay much attention to an unreal fear trying to hold you back? I don’t think you would. Are you in a position where you find it difficult to enjoy your life? Perhaps you’re so discontent with what you’re doing this moment, your imagination is leading you to some pleasurable event that might happen in the future. If today was your last one, do you think you might quickly look to enjoy and find joy in what you’re doing right now, no matter how mundane the activity? Today there will be people you will come across in your environment. Let’s say you end up with a person you don’t get on with much. If your time was coming to an end this very day, do you think your mind would be able to carry even a minute piece of resentment towards this individual? Or do you think all you would feel is love for this person, who is most likely the last person you’ll ever see? I think it would be love. What about you? If today was your last day, then surely you would want to go out in style. Therefore, whatever you’re doing, how can you do this one activity so well that people would tell stories about it? And as I explained earlier in this post, even if the activity you’re doing is simple, I wonder how you might do it with some style? When those close to us are about to leave, unless they’re in a lot of pain through illness and injury, they’re usually peaceful during their last days. If you were living today like it was your last day, then I’m guessing if you had a choice between experiencing peace, or worry, you would select peace. How can you bring more peace into your life, this very moment? If today was your last living day, I’m sure you would want to leave behind one act of good work. It could be doing a service to another person; it might be as simple as being present with someone to help them deal with a difficulty he or she is experiencing. Therefore, what service will you choose to do today? • In what other ways can living our lives like today is our last day, help us to be better people? Our outlook would definitely be different if we truly lived our life as if it were our last day. The choices we would make, the people we would spend time with and our outlook would be on a whole new level. As time passes, your post is an always needed reminder to live life to the fullest, so when you come to the end of the road, you have no regrets! Thanks for the reminder! It’s great to see you here my friend! What you wrote in your comment is so true and indeed, living this way would totally change our outlook on our daily lives. I’ve been experimenting with this approach myself over the past couple of weeks and the results are tremendous. If I’m feeling stuck with a particular activity, or worry about something, I remind myself that I’m living today as if it’s my last, and it completely transforms my attitude. If we live life as if today were our last day, we would simply value it SO much more I think. Every breath we take or deed be do, would make so much more meaning to us I think. We would be very conscious of everything because we know we have them for a limited time so we would do those tasks in the best possible way. Loved your points too and they would all make us better people. Living life SHOULD be as if it’s our last day on Earth, only then would we be able to value it much more than we usually do. Sadly, most of us don’t live like that – or don’t live life to the fullest, which we should. Thank you so much for leaving such an inspiring and motivational comment! I just loved it. Indeed, as you say, living each day like it was our last would be so humbling that we would cherish each breath we take. As you also say, this is how we should be living, yet it can be so challenging to do. Practice really can help. As I said in my response to Cathy’s comment, I’ve been experimenting with this approach recently. Whenever I find myself being affected by negativity, I remind myself today is my last day and it completely transforms the way I’m feeling. The more I think about it, the more I think our problems are exacerbated because we forget life is short and we think we’re going to live forever! I do often reflect on my own death, and find it very life-enhancing, as you suggest. As a twist on this, which I heard in a blog post a while back, try treating everyone you meet as if they don’t have long to live – it focuses the mind. Many thanks for sharing your experiences with reflecting on death. It really can be humbling and as you say, life-enhancing. I really liked the alternative approach you shared about treating everyone as if they don’t have that long to live. I can see how this can also be transforming and really help us to empathise and be compassionate towards others. I will experiment with this approach. You’ve lit a fire under some backsides here my friend. I get your line of thought. A bit of ‘shock’ treatment may be the answer for some and get them moving from a dead still position or one where they could push themselves that little bit more …. others may well, go into shock and freeze on the spot, if it was to be their “last day” … Interesting experiment. I get my inspiration from the fact that I’m “here” and enjoying each day however admit I am prone to some lethargy on occasion … my last day will come but I hope I have a celebratory beer in my hand at the time. Indeed, you’re right, this approach is a bit a ‘shock’ treatment and needs to be used with care. As you say, some people might be able to get motivated from it, yet others can end up freezing. I’ve been experimenting with this approach recently, and it can really be humbling to say the least. I guess one way it has been helpful is learning to not take life for granted. I like your approach of enjoying each day. One can turn this into a habit, as opposed to taking it further and contemplating on death. Absolutely, going out with a celebratory beer would be wonderful! this is indeed a nice article. The niche is so attractive. I read somewhere that “life is to be LIVED not to Spend”. Enjoy every moment of life, spread happiness, this can make our life wonderful. If we live life as if it the last day we can make better choices and most importantly live more. Thanks for sharing such a beautiful article with us. I’m so glad you liked the article and many thanks for adding so much more to it, through your comment! 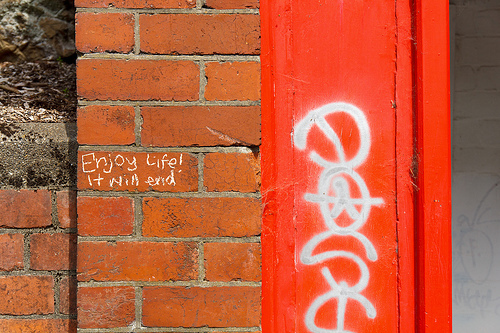 Indeed, as you say, enjoy every moment and spread happiness. What a great motto to life by. Absolutely, I agree with what you say about how living life as if today is our last day, would help us to make better choices. These choices would be real ones as opposed to those that we can often take blindly when we take life for granted. Many thanks for your wonderful comment, Dheeraj! I’m so glad you could resonate with this post, my friend. This type of perspective really is humbling. It makes our daily stresses and problems seem insignificant. As you say, the choice really is between love and fear. And we definitely have it in us to choose love for considerably longer periods throughout the day. I enjoyed this post, and it caused me to really think about the way I approach each day. Really, we all have the ability to make the most out of each second of each day. Your points about not holding on to resentment, serving others, choosing peace, and moving past fear are right on. It spoke to me today. Thanks for your inspiration! I’m so glad you liked the post and I loved what you shared in your comment about how we have the ability to literally make the most out of each second, every day. Earlier on today, I was getting caught up into insignificant discomfort (my ego was activated). I reminded myself that today was my last day and it was a trigger for me to smile and enjoy the moment. It really is a strange consciousness but it certainly does work. Many thanks for leaving such a wonderful comment, Victor. Hope you’re have a great week! Thank you, Hiten, this really was perfectly timed for me. I am grateful. Karen Jolly recently posted..Four Steps to L.E.A.P. I’m really glad you had some great results with this approach. It really is humbling, isn’t it? It makes those daily ‘problems’ we get caught up in seem insignificant. It’s amazing how adopting this consciousness really does evoke strong feelings of love and peace in us. Many thanks for sharing your experiences with travelling through the rush hour period, Karen. Suzie – I love this question you added in the comments to Hiten’s post – is what I’m doing now shining my light to the world? Excellent question to ask daily. Terrific post as always Hiten!! I’m so glad you liked the post and many thanks for sharing your experiences with this practice! As you quite rightly said, it can be tricky to remember, as we can get caught up with daily stresses. I like to think of it as a type of meditative practice. When I get caught up in the moment, I remind myself that it is my last day, and suddenly my attention becomes totally focused on what I’m doing. It really is quite transforming. Hiten, I’ve been doing this daily and have been doing so for the past year or more. I used to not live it was the last day and was doing a lot of things I didn’t like, and spent my day innundated with busy work. but that has stopped – I like to think I’m living more consciously now a days which means more rest, more enjoyment, more connection and more fulfillment. I’m just thinking about today, for example and yes, there has been peace, enjoyment, service and friendship! I spent a good portion of the day doing the day on my terms. The question of living like it’s your last day is so real and pushes us to confront of the type of life we want to live. Thank you for reminding us to live each day to the fullest and in essence, living in the present moment. Thank you so much for sharing your experiences with this particular practice. The way you live, day by day, is amazing. I can definitely resonate with what you wrote about living consciously when we adopt this approach. This is so true. When we live like this, we look after ourselves better and appreciate other people, so much more. I always wait for such kind of post from you. It is well said live life like today is your last day beacuse ‘kal ho na ho’ . As you said in this article do enjoy, do anything what you want without any fear is really appreciated. But it is not so easy to forget past and futures worries. Anyway thanks for the tips. I’m really glad you like the post and what you stated in Hindi is exactly how it is. Tomorrow might happen, it might not. Therefore, we need to cease each day like it is our last. Absolutely, you’re right. We can easily get caught up in the past and the future. When this happens, we can remind ourselves not to take life for granted and enjoy the present moment. Thanks for leaving such a wonderful comment, Rupali. Have a great weekend! A part of my mind does want to live like this (I want to..actually). But, these days, I am also thinking about my studies (there is hardly any free time, once I get things done). Perhaps I should just try to make the tasks I do daily more interesting? (Perhaps….the thing is things might be too similar. You know, get home from college, do HW, study and blog. Every day!). I really have no idea what to do here 😉 I want to enjoy life, but I also want to keep up with everything (I do want to try new things, but I find time as limiting factor. Perhaps it is only limiting within my own mind?). Jeevan Jacob John recently posted..Is Your Blog Special? You shared some wonderful insights, my friend. Indeed, I can appreciate your situation. I can remember the challenges that being a student brings. I would suggest to keep focused on your studies and make time where possible for activities that you enjoy. Jeevan, you’re so wise already for a young man your age and I’m so excited about what you will achieve in your life. Wishing you the very best and have a wonderful weekend! I’m so glad you enjoyed the post, and many thanks for sharing the wonderful quote! This is exactly how we should be living. Life is just to short to worry about just making it through ‘difficult’ situations, which really are not difficult at all. A lot of the time we’ve forgotten that we really don’t know what will happen tomorrow. Therefore, we might as well have fun doing whatever it is we’re doing today. Many thanks for your great comment, Marty. Hope you’re having a wonderful weekend! We have heard this phrase thrown around loosely so many times. It rolls off your tongue with such ease that we never really give it a second thought. Which is exactly the problem. When I read this article, I found myself stepping back and really absorbing the content, putting myself in the position we will all be someday, and it was truly eye-opening. Perhaps it was your choice of words or manner of focus, but it becomes very apparent that it’s called life for a reason. It is meant to be lived, actively and fully in the moment. Thanks for the wonderful reminder and best wishes for an inspired day! Welcome to the blog, and I’m so glad you enjoyed the post! Indeed, as you say, life is meant to lived fully each moment of every day, because the truth is we just don’t know what will happen tomorrow. Many thanks for leaving such a wonderful and inspiring comment, Dave. Hope you’re having a good weekend. Living like today is our last day would defiantly cause us to break through our fears and do the things we normally would not do. We never know when we will die so we have to be willing to make everyday count. Amazing thoughts in your post! I’m really glad you liked the post, my friend! As you quite rightly said, we just don’t know when we’re going to die. It makes more sense to not take life for granted and to enjoy every moment. Many thanks for commenting, Dan and hope you’re having a good weekend! I do use this myself however. Several times a week. Many thanks for sharing your experiences with this approach. As you say, it can be tough. When we experience it totally though, it can be so liberating! We usually make the mistake of living everyday as if we are going to live a thousand years.Never to die. And thus we go on doing wrong ,being small minded,accumulating disturbances,fighting within ourselves and with others. We relish indulging in our complaints ;real or imagined. We let the “little beetles” of life, beat us down. Live each day with high value,squeeze the last ounces of joy out of it ,spread joy,spread happiness all around. Let us be detached and light,spiritually attuned and willing to do a lot of good. richmiraclefiles recently posted..Profound Quotes; Hear Something ? Indeed, it is just how you said it. We make the mistake of believing we’re going to live for ever! The more I think about, the more I see the truth that so many of our problems continue because we believe this. As you say, we continue to experience inner turmoil and would continue to do so if we take life for granted. I loved what you said about living each day with great value and squeezing the joy out of each moment, while spreading happiness. This is just the way to live! Many thanks for your wonderful comment, Mona! Living our last day, knowing it was our last, would make it so much more purposeful, so much more filled with love and gratitude. Every now and then I have taken to stopping to re-evaluate my daily life, and to question, if today were my last day, was it a great day? And perhaps more a frame of mind that an act of physical being, I’m pleased to note that, the answer has been yes every time. Indeed, as you say, living our lives this way really would make each day so meaningful and peaceful. Many thanks for sharing your experiences with using this approach and the great success you’ve had with it. Hope you’re having a wonderful week, Li-ling. First time i visited your blog must say, there are alot of quality content that one could read, i was reading few of them, anyways. I really like this thought ” Living life as if today is your last day”. We are surrounded with alot of things, situations, relationships, work pressure. And it seems very boring with no enjoyment. But if a person is given a last day he/she will react to it differently. Welcome to the blog, and many thanks for leaving your great comment! As you said, we can become overwhelmed by daily life, and when we do use such a mindset, the way we would react would be so much different, for the better. Hope you’re having a great week, Nidhi! It’s not about living today as if it’s your last day. I think it’s about living today as if it is the most important day of your life… because it is. It’s the only day that will ever exist. It’s the only day that we can make decisions on and interact with. jamie flexman recently posted..I Had NO IDEA How I Was Gonna Do This… but I did it anyway! What a wonderful way of putting it. I’ve been adopting the approach you shared over the past couple of days. Adopting the mindset that today is our most important day sure is powerful. Thanks very much for sharing this approach and for leaving such an inspiring comment, Jamie! Hiten, as ever you don’t disappoint! A great list. My father always spoke about on his death bed nobody says they wish they spent more time at the office, but he never followed that with action. He still neevr spent time with us, but kept saying it over and over. I am determined not to do that. I’m really glad you liked the post, my friend. Indeed, I’ve heard some of my senior friends from my public speaking group say that one major thing they regret is not spending enough time with their families. They were too busy working on their businesses. Thanks very much for commenting, Jodi and have a great weekend. Living life as if every day is your last can be some great advice. I know many of us (well at I know at least myself) can get easily caught up in the cycle of working our tails off for some “future” happiness. While there is a good side to the ability to delay gratification in this manner, it is not everything. Enjoying the moment is an invaluable skill, that leads to real long term happiness. Many thanks for leaving your wonderful comment. As you quite rightly said, detatching from too much expectancy of happiness in the future, and learning to live in the present moment really does lead to longer term happiness. Have a great weekend, SJ! Another great post as always. I have to constantly remind myself this daily, especially when I get days where I trick myself into putting off the things I know I should do by saying “Its fine, I can do it tomorrow”. It’s probably the most common excuse people give themselves that gets them to procrastinate. So I think reminding yourself of the fact that there are no guarantees of there being a tomorrow really helps you get the most out of your day. Many thanks for your great comment, my friend. Your point about using this approach, especially during those times when we procrastinate was really interesting. It’s amazing how such activities actually end up being fun when we adopt the mindset that today is our last day. Hope you’re having a great weekend, Onder! I was not believing this thing before unless and until an incident happened to me, which thrilled me to the core yelling on me that what the hell are you doing on this earth wasting the time? Since than it is like every morning waking up with a gratefulness into my heart and mind and thanking God for a wonderful sleep. Then my day has proceeded with beautiful people and my passions are always in full momentum to execute any task in the given time. Very impressive language and words are used on the page. This is the best way of representing a topic. Easy language and words are used+they are very easy to understand. I will share this website and information given in it. Rahul Kumar recently posted..Hello world! This is very helpful. It truly can help make every day better if we lived like it was our last day. With this concept it encourages happy thoughts and making peace with ones self on a daily basis.